check his hands for nail holes"
Colleen was the author of the online book, "Kombucha Unveiled" She was the five year owner of the Kombucha information list, moderating the list up to a couple of weeks before her illness caused her to be hospitalized, at which time she turned the list entirely over to Bob Williams. The Kombucha list was very important to her, she thrived on bringing the information about Kombucha to the newcomers and curiosity seekers. She was adept at researching information on the internet. If she didn't have an answer she would find one. Her Kombucha FAQ is a tribute to her ability to compile information. It is a virtual encyclopedia of Kombucha information. She has certainly left a legacy that will continue to help many for a long time to come. She will be greatly missed. Colleen has entered her celestial domain. our beautiful Momma has had to depart. we all feel empty, alone and bereft. "No more of this crap!" She's Dancing with Spirits, 'tis time to rejoice! We just feel cheated it was never our choice. that brought so many together. 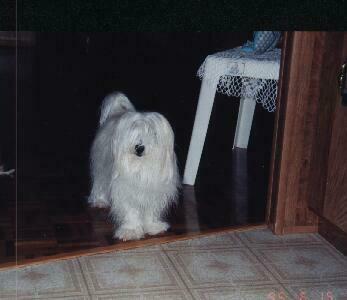 Tiger, a Maltese, was Colleen's constant companion. She called him her "shadow". Click on his picture to see some of her other "critters". In the spring 2000, Colleen received frog eggs from her brother, she raised the little tadpoles pictured below at three weeks of age. Colleen was ever so pleased and proud of her frog pond, pictured below ready and waiting for it's new tenants. Colleen was very talented and creative with her hands. 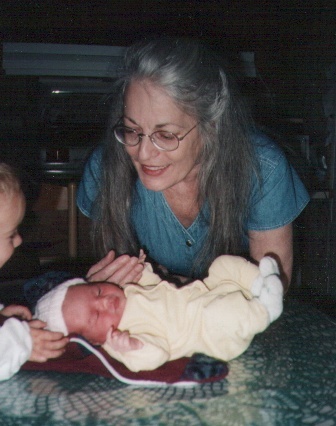 Her handmade quilts were works of art which she lovingly made for family and for herself. Click on the quilt made for her Grand-daughter Natasha to see more child sized quilts Colleen made for her family members. Colleen also made large quilts and afghans for herself and family. Click on the afghan to see some more of her handiwork. (The little guy is her cat Ming). Click Here to see other quilted wall hangings and handcrafted gifts made by Colleen. Due to her illness, Colleen was unable to go out of her home. She surrounded herself with as much nature as possible, along with her houseplants, she cultivated terrariums as well. It was an outlet and source of pleasure for her. You can click on the photo below to see some of her houseplants. Colleen's garden was very important to her, it was an extension of her connection to Mother Earth and nature. She was very proud of the fact that it was in bloom 10-11 months of the year. Below is my favorite picture of her Garden, click on it to see others. Colleen cared about people, dealing with her own illness, she knew how it must be for children to be ill, so she made these knitted teddy bears for the children at the Vancouver Children's Hospital. 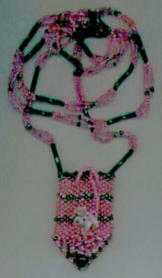 Her beaded pouches were beautiful works which she gave lovingly to her friends. Click on the picture of the one she made for me to see more of her creations. This is the birthday gift Spirit sent me, several months early, when I sent her the page to show her that they finally had a "Cheryl" doll, but wouldn't we guess it would be a "wild" woman! She said it was truly "Water Sprite" and got one for each of us. I will cherish this doll forever.